DANNY Handling scored the decisive goal which took Terry Butcher’s men through in the Scottish Cup. It was the Easter Road side’s first ever win over Ross County and Butcher’s first win since taking charge in Leith. Handling struck in the 31st minute when he tucked away a through ball from Hibs captain Liam Craig. But the Edinburgh side had to play for the last 20 minutes with 10 men after Paul Cairney was sent off when he was shown a second yellow card. County made the better start to the match without really threatening the Hibs goal. The visitors went close in the 11th minute when Craig slipped the ball out to Handling whose low cross into the box was swept behind by Melvin De Leeuw for a corner. Hibs were starting to spread the ball about with Craig prominent in all their best moves. It was Craig who picked out Cairney at the back post with a floated pass but his angled drive was easily held by Mark Brown. At the other end Gary Glen had the ball in the Hibs net but referee Craig Thomson had already blown for an infringement in the box. De Leeuw was next up with a speculative drive from 30 yards but his effort was well wide of Ben Williams’ goal. But it was Hibs who took the lead in the 31st minute. County lost control of the ball in a dangerous area and Craig slipped the ball through to Handling who drilled it beyond Brown for the opener. County were forced to make a change just before the break when Branislav Micic was replaced by Steven Saunders, after clashing with Handling. In first half stoppage time Richard Brittain let fly from outside the 18-yard box but his attempt drifted over the crossbar. 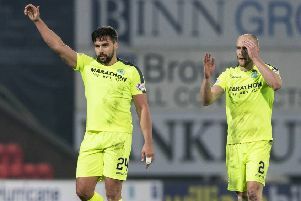 Hibs had one last chance before the interval when the ball broke to Scott Robertson following a corner kick but his low shot, through a group of bodies, was gathered by Brown. County pushed for an equaliser early in the second half and a chance looked to be on when De Leeuw threaded the ball through for Kevin Luckassen but Williams beat the County forward to it and the chance was lost. Most of the action was at the other end but in a breakaway move in the 60th minute Stuart Kettlewell got on the end of a Rocco Quinn cut back but his shot from just inside the area was deflected behind for a corner. County went closer a couple of minutes later when Carey swung a ball over from the left and Luckassen headed against the near post. Hibs, who looked to be well in control, were dealt a blow in the 71st minute when Cairney was dismissed. The midfielder, who had been booked in the first half, wriggled his way into the box and went to ground as he tried to round Brown. The referee saw it as simulation and produced a second yellow card. It was 10 apiece for the last few minutes when Saunders went off injured but there were no more goals as Hibs booked their place in the next round.